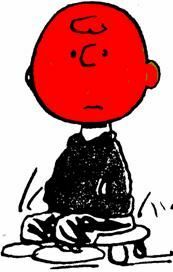 Erythrophobia (from greek: erythrÃ³s - red), also known as ereutophobia (from greek: ereuthÃ³s - redness, flushing), or known by the English word "facial blushing," is defined as the fear of blushing. The typical sympathicogenic erythema is characterized by blushing that evolves within seconds, mostly accompanied by other symptoms and signs of exaggerate reactivity of the sympathetic nervous system, like increased heart rate, rise in blood pressure, sometimes even sweating and trembling. Only a signal from a nerve can be behind such a rapidly evolving phenomenon, which often also tends to disappear rather quickly when the stress causing factor is gone. Normally, this category of erythema involves the whole face, occasionally also diffuse or blotchy redness of the neck and the decolletÃ©. An infrequent form of sympathicogenic erythema involves only cheeks and ears ("butterfly" erythema or "geographic" type), leaving the area around the mouth and the remainder of the face pale. This rapidly and uncontrollably appearing blush is the type of erythema that may eventually cause erythrophobia. There are constitutional (genetic) and environmental factors that cause the blushing and its associated symptoms. If these symptoms appear regularly in certain situations and are reinforced by the reaction and the behavior of other people, they may rather quickly lead to the development of erythrophobia. These subtypes of long-lasting erythema may be irritating, but they generally do not match the embarrassment of sympathicogenic erythema and rarely lead to sociophobic reactions. Closely related are the psychological factors related to the fear of making mistakes, to make a fool of failing an objective, do not feel up to the situation, the frustration of not achieving the perfection one aims at. The symptom occurs mainly in presence of a superior or in a group situation, when the individual, noticing the attention of the counterpart focused on her/him, starts compulsively thinking about the imminent risk of blushing and at the same time experiences tension, tachycardia, an unpleasant tightness in his chest and a intense sense of heat rising to the face. Even the slightest hesitation in speech or even the awareness of not appearing relaxed may cause a loss of concentration, interfering with the individual's capacity to perform, to keep sovereignty in such situations, while desperately struggling to not get overwhelmed by embarrassment. This triggers a vicious spiral dominated by obsessive anxiety that in some instances may lead to a complete mental black-out and a wish to disappear or flee. in less severe cases: sense of frustration for the enormous waste of psychic energy needed to cope with situations where there is a constant risk of embarrassing physical reactions to emotional stress. in severe cases: depression, hopelessness, suicidal thoughts. There are several physical and mental techniques that aim to ease nervous tension and to prevent attacks of redness, useful in some people, less effective in others. These methods such as auto-suggestion, yoga, biofeedback, breathing techniques and progressive muscle relaxation, all aimed at improving self-esteem and self-confidence, and / or reducing inner tension and unwanted physical reactions (especially tachycardia and palpitations). These techniques can be practiced in groups or alone, or as a supplement to psychotherapy. A counseling is almost always indicated. For erythrophobia, cognitive-behavioral therapy (CBT) or hypnosis is generally employed. More intense exposure/desensitation therapy techniques, like "flooding", potentially effective in other types of phobias, is not recommended and may even increase the vulnerability of the subject. In general, psychotherapy does not eliminate the autonomic reflex of blushing, established and consolidated over years, but it can help the person to live with this reaction, by increasing self-esteem, and thus reducing the negative impact on the quality of life. Beta-blockers: reduce palpitations, limiting the increase in heart rate under stress. The heartbeat is in fact often the main trigger of a chain reaction that leads to an uncontrollable increase of emotional stress associated with physical manifestations. The intensity of the blushing attack may be reduced and mental activity may not be dimmed. Clonidine: an alfablocker which reduces the motility of vascular muscle, stabilizing it and limiting the sudden change in diameter of the small cutaneous vessels of the face. Unfortunately the side effects (hypotension with dizziness, dry mouth, etc..) often restrict the use of this drug. This is a class of antidepressant drugs which is useful in compulsive (anancastic) syndromes, reducing the level of anxiety triggered by obsessive thoughts. In erythrophobia, these drugs may reduce the constant fear and worry of blushing by increasing the stress threshold that would trigger the syndrome. Sedatives: Benzodiazepines are not indicated as a therapeutic approach for long-term, due to the risk of inducing drug dependance. Even alcohol can be categorized as a sedative: no doubt it can ease tension if used occasionally, in moderation and with all the necessary precautions, but obviously it cannot be considered as a solution to the underlying problem. Already in the 80ies, a positive effect on the syndrome of facial blushing was observed in patients undergoing interruption of the upper thoracic ganglia of the sympathetic chain for other reasons. In the 90ies, these findings were confirmed, allowing to extend the use of endoscopic thoracic sympathectomy, originally developed to treat hyperhidrosis, also for the treatment of erythrophobia. Today, surgery of the sympathetic nerve is available as a therapeutic option for patients with disabling erythrophobia if satisfactory control of the disorder cannot be achieved through non-surgical measures. Surgical therapy is most effective in the classical forms of sympathicogenic erythema, characterized, as described above, by sudden redness involving the entire face with or without concomitant symptoms associated with overreactivity of the sympathetic nervous system. The efficacy of the method can easily be demonstrated in one and the same patient if the surgery is performed sequentially, first on one side and then, after days or weeks, on the other (see photo). Such asymmetry ("Harlequin phenomenon") may also arise after the surgeon missed the correct level on one side, placing the clip too low on one side (usually on the left side, due to the physiological asymmetry of the pleural space). 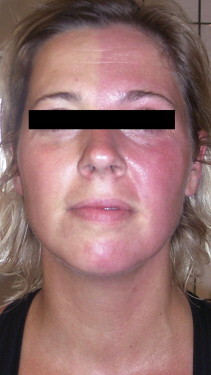 Localized forms of facial blushing ("butterfly" erythema), characterized by intense redness of the cheeks and / or ears, while the forehead and typically the perioral area remain pale, do not respond equally well to the surgical treatment, yielding inconsistent results (good control in only 50% of the cases). Therefore, surgery can not be recommended for this type of blushing. Facial redness developing slowly and gradually in response to physical activity / sport or prolonged exposure to heat may only be reduced partially by surgery, reflecting the secondary role of the sympathetic nervous system in these cases. Anyway, most patients operated for severe blushing do also report a certain degree of improvement of this slow type redness, too, though not having been a major problem previously. The operation is performed under general anesthesia and aims at interrupting the sympathetic chain between the T1 and T2 ganglia to cut off the main stream of signals reaching the facial vessels without interfering with other functions (e.g. the movement of the eyelids). These ganglia are located in the uppermost part of the chest cavity close to the spinal column. Nowadays we prefer to compress the nerve using a titanium clip (ESB - Endoscopic Block of the Sympathetic Chain) instead of an severing it irreversibly (ETS - Endoscopic Thoracic Sympathectomy). The procedure is identical to the one usually used to treat facial sweating, but not the same as ETS/ESB for palmar hyperhidrosis. Sympathetic surgery is unquestionably very effective with regard to the redness and the phobic state. Many patients feel suddenly liberated from years of silent, suffocating and often underestimated suffering. According to various studies, the success rate in centers with large experience in the surgical treatment of erythrophobia varies from 90-95%. It must be emphasised however that the procedure may be ineffective in some, and in others there is the risk of a partial or complete relapse (around 5-10% within the first 3 years after surgery). This results in a cure rate of over 85%, provided a careful selection of candidates for this treatment performed by a surgeon who not only possesses great experience with surgical techniques optimized for this purpose, but also a deep knowledge of the disorder. compensatory sweating: sweating on the trunk and / or legs, reported by the majority of patients operated on, usually mild or moderate, but in a minority of cases it can reach unbearable levels. In our series, among patients operated on for erythrophobia the percentage of reversion (ie the removal of the clips because of side effects) for compensatory hyperhidrosis is 1%. By comparison, 12% of patients operated on for facial hyperhidrosis require the removal of the clips because of excessive compensatory sweating. Compensatory sweating never includes face or hands, which indeed tend to be drier after surgery. lowering of heart rate and blood pressure, decreased responsiveness of the cardiocirculatory system to emotional stimuli: it is an effect that is especially noticeable in patients operated on for erythrophobia and less evident in those operated for hyperhidrosis. It is almost always a welcome phenomenon, which contributes considerably to the feeling of tranquility and serenity that generally supersedes anxiety. Excessive reduction in blood pressure or heart rate may lead to a state of weakness and fatigue that may require removal of the clips in approx. 2%. This rare state of asthenia contrasts with the increased energy and vigor that most patients experience when they feel freed from overwhelming anxiety. gustatory sweating: it represents an increased heat sensation and tendency to sweat in the face after eating e.g. spicy food. The phenomenon occurs in some 25-30% of the patients after surgery, but rarely reaches annoying levels. In summary, it is a safe procedure, with rare complications and a relatively high success rate regarding the control of blushing and related symptoms and sociophobic behaviour. The neurovegetative nervous system is, however, very dynamic and tends to adapt continuously during lifetime to all environmental or organic changes and conditions. Therefore, it reacts very individually when a reflex circuit has been blocked. The resulting side effects cannot be predicted in detail, and though they in most patients are relatively mild or even absent, there is a small group of patients developing heavy side effects. Therefore, surgery should only be considered in carefully selected cases in whom non-invasive treatment has failed and in whom the detrimental consequences of erythrophobia regarding the psychosocial situation and the quality of life is such to justify more adverse side effects. It should also always be kept in mind that therapy can be ineffective and that, in the long term, 10-15% of patients do not consider themselves satisfied with the result of surgery. In any case, the author prefers the use of a potentially reversible surgical technique (ESB), instead of destructive techniques (cutting, coagulation, removal of ganglia).